Jackie Wallace comes to us with extensive experience in the education field and made it her mission to become an expert in several key career fields our students love! Jackie understands the importance of doing what you love, and she LOVES helping students change the world through these industries! These can include teaching professionals and other education positions outside of the classroom, working in the “helping fields” to make the world a better place, any local/state/federal government or military career options, and more! Whether it is the Peace Corps, the local school district, a federal job in Washington, or working in a counseling center, Jackie can help you explore your options and prepare to compete! Feel free to download download her flyer! Meet with Jackie. Explore career fields that make sense for YOU and begin to plan your professional path. There are methods that work best for these – let’s work together to move your career forward. I work every day to connect with organizations that can connect to our students! Networking is key, and I have contacts! 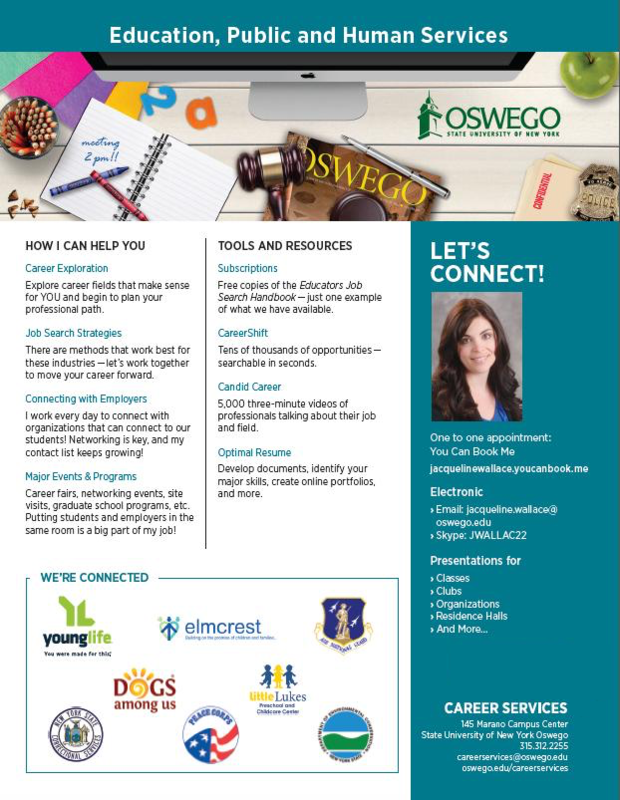 Career fairs, networking events, site visits, graduate school programs, etc. Putting students and employers in the same room is a big part of my job! Connect to employment opportunities through the American Association for Employment in Education's job board. Tens of thousands of opportunities – searchable in seconds. 5,000 three-minute videos of professionals talking about their job and field. Develop documents, identify your major skills, create online portfolios, and more. Recruit Long Island - Recruit Long Island is a Facebook and LinkedIn group built for anyone who works, or wants to work, on Long Island. The intention is to create a community discussing working on Long Island, as well as posting jobs and networking to find a job. Also, check out our Job Search Sites for Teacher Candidates.